Sure, you’ve known for decades that your Mac can talk. But did you know that it can now have an Indian, Australian, British, Irish, or Scottish accent? And that it can speak French, Japanase, Chinese, and numerous other languages as well? 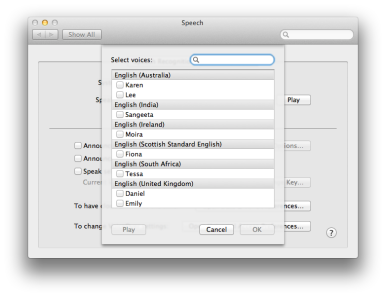 Hints reader nathanator11 discovered that Lion offers access to dozens of new voices for leveraging your Mac’s text-to-speech abilities. Here’s how to find them. Launch System Preferences and click on Speech. Make sure you’re on the Text to Speech tab. Click on the System Voice dropdown menu, and select Customize. You’ll see a mammoth list of voices to choose from. The voices are broken down by language and nationality. Click on a name and press the Play button at the bottom left to hear the voice introduce itself. Click on the checkbox to add the voice to your Mac’s System Voice options. As it turns out, most of the voices (with the exception of many of the U.S. English voices) aren’t actually installed on your Mac at all. When you check off voices that aren’t on your Mac, yellow triangle icons will appear next to them—indicating that those voices will need to be downloaded. Some of the downloads are huge. I installed eight voices, which totaled 4GB—larger than the entire Lion installer. But if you like to mess around this sort of thing, it’s a blast: My Mac now speaks to me with Lee’s delightful Australian accent. say -v Sangeeta "That's enough mucking about in Terminal now. Why don't you go read some more articles at Macworld?" Of course, you can only specify voices that you’ve installed via the instructions in this very Hint.